Okay … so I just bought a new notebook computer online because my USB ports have gone kaput. BTW … thanks for the tip Nora. 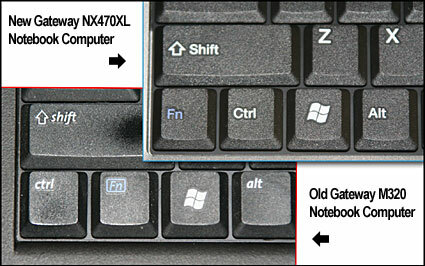 The new Gateway NX570XL arrived today and is pretty nice — BUT … what are these people thinking? Swapping the ‘Fn’ and ‘Ctrl’ key positions??? Perhaps others have experience this or read about it online, but I’ve obviously missed this change? I’ve glanced at every keyboard I have in my house whether Mac (yes they have other odd keys) or PC and they are all the small. ‘Ctrl’ key on the left bottom corner. Since I rotate between Mac, PC desktops and my notebook, this going to drive me crazy. Perhaps I should check to see if there is a remapping available. Thoughts anyone?